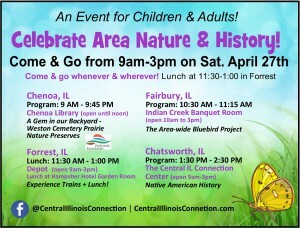 Visit the Chenoa Library on Saturday, April 27th as part of our Celebrate Area Nature & History! event! There will be a live presentation from 9-9:45 am about the Weston Cemetery Prairie Nature Preserve. 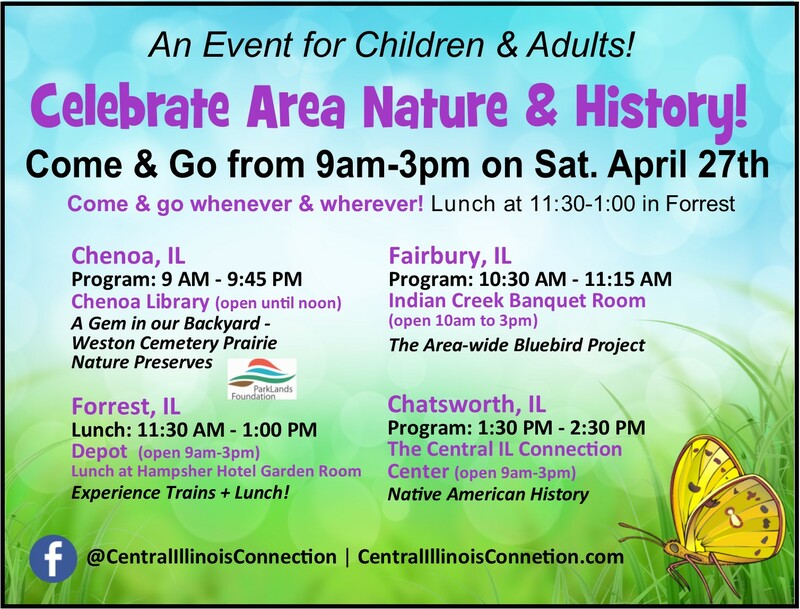 Dr. Roger Anderson, Emeritus Restoration Ecologist with ParkLands Foundation, will present a “lost world” through the window of 3.83 acres just outside of Chenoa! Over 70 native plants species are protected here. This is the only remaining prairie preserved in all of McLean County! Stop by for refreshments between 9 am and noon (while supplies last). The library closes at noon. Hope to see you there! This is a reminder that some changes are coming to eRead Illinois also called Axis 360. Patrons who have items checked out prior to the switch will still have those items for the remainder of the 21 day checkout period. Thank you for being a part of eRead Illinois! We thank everyone who voted for a new library. On Tuesday, November 6, Chenoa voters will have the opportunity to support a bond referendum that will provide our community with not only a new library but a facility that will serve as a center of community activity for many generations to follow. This structure will be accessible to all of our residents. After years of research, investigation, and planning, the Chenoa Library Board of Trustees is offering to our community a means to fund, build, and complete the project. The referendum has unfortunately become necessary because fundraising efforts have not met the lowest bid proposed by an area contractor. The top priority in the planning of the new library is to have a completely accessible building for Chenoa. The new library has been designed by architect, Mr. Russel Francois, and has a 1,500 square foot children’s area, an 800 square foot community room, areas for adult reading and study, along with space for accessible shelving and technology. Due to the diligence of our director, Ms. Sheryl Siebert, the furniture has been very economically secured through transactions with other libraries. I cannot emphasize enough to our community that our new library will not just be a “house of books”. Our new facility will truly be an active center of community learning and socializing for many, many years to come. I sincerely believe that construction of the library will create countless learning opportunities for us all – including many that we have not even considered! We have published the figures and realize the sacrifice that we are asking. 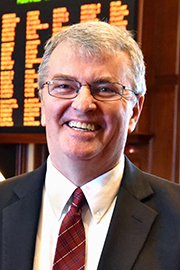 I am still convinced that a successful vote for the building of our new library will be a benefit to every resident and the community of Chenoa. I hope that you will join me in voting “Yes” on November 6th. If you want to hear Lee Green, the solar eclipse astronomer who spoke to us last year, put Oct. 20 on your calendar. We will have child crafts at 6:30 and Lee at 7:00 pm. 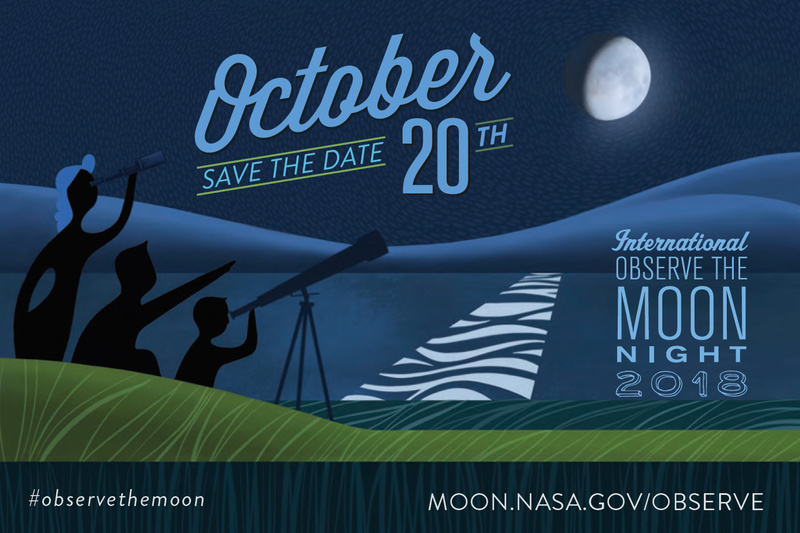 He will be at the library to talk about the International Night of the Moon. Guess what – HE IS BRINGING HIS TELESCOPE again. You can borrow a fishing pole at the library? Whaaat? We have 3 fishing poles at the library that can be checked out for the fishing derby on Sunday, Sept. 9. We thank Ed Straw for getting the fishing poles ready. Catch us by noon on Saturday to borrow a pole. EDP Renewables North America, owners of the recently approved Bright Stalk Wind Farm, have generously established a $10,000 matching funds grant to help with construction costs of the new Chenoa Public Library. EDPR NA will match all contributions made to the library’s building fund up to $10,000 !! Chenoa Public Library has raised 50% of its goal !! Due to our community’s tremendous support, as of November 2017, we have $403,000 in the bank for a new facility that has an expected cost of $800,000. We are continuing our pledge drive to complete our mission of providing an accessible library to the citizens of Chenoa. Please contact the library if you wish to help – 815-945-4253. THANK YOU. Your financial promise to the Chenoa Public Library Building Fund is tremendously appreciated. *Contributions are tax deductible.